​Leticia Garcia is a native born Texan. 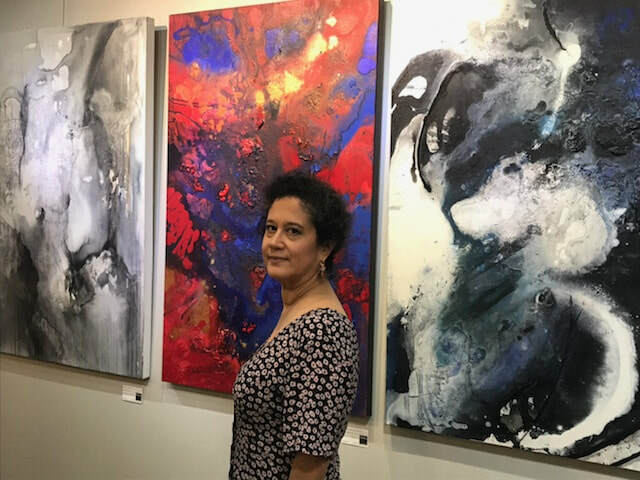 A long established member of the Houston art scene and educated at University of Texas and U of H, Leticia has been painting for over 30 years with abstract expressionism her preferred form of communication. As the daughter of a US army CSM, posted overseas her upbringing as an army brat brought exposure to numerous new environments, but also impeded her in putting down roots and establishing relationships. Painting became her escape from an early age, with works influenced by her changing environments. This shifting set of circumstances caused her to search out harmony and a sense of completeness, albeit one created from conflicting elements in her paintings with colors and shapes juxtaposed, searching for a resolution that balances the forces at play on the canvas, but never becoming anodyne. Her art is all about the actual physical means of moving and manipulating paint on the canvas and adding textural features to enhance the individual and collective elements of each picture. With age, her art has become less of an escape from a world she could not control and has become a journey of exploration in which each picture presents itself as an infinite set of possibilities. The act of moving paint on the canvas is all-absorbing for her and she admits to becoming lost within the process of deciding what works and what must be sacrificed, but without allowing the picture to appear as a compromise. She likes to regard herself as an alchemist, trying to synthesize something totally removed from the physical world. Her work almost invariably evokes emotional reactions upon first viewing and this is very much a reflection of the feelings she experiences during the creative process. Ambiguity is present in many of her works and it is up to the viewer to make their own interpretation of the motivations that go into creating each painting. “I lose myself in deciding what stays and what goes. When I like a detail that has to be sacrificed later in development of the painting it can be difficult, but the needs of the painting must necessarily override my prejudices as the artist. For me, the objective is to touch a chord both in the viewer’s conscious mind and in their subconscious and this requires a brutal honesty as to what does and does not work”. © 2018 DaVinci Artists Gallery. All rights reserved.